Steve Schuch leads The Night Heron Consort in their nationally acclaimed Yuletide recording. As with Crossing the Waters, the album fuses Celtic elements with classical and contemporary influences. Instruments range from delicate harp, Irish whistle, piano and gemshorn to full-bore Celtic chamber orchestra with massed fiddles, percussion and pipes. "Vibrant and fresh renditions... akin to the soundtrack of Riverdance." Most browsers are automatically equipped to play mp3 and wave sound files. by Allison King of New England Cable News. 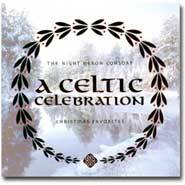 Find out what's different about Night Heron Music's Christmas album 'A Celtic Celebration Volume I'. Hear about the unusual instruments and arrangements, the famous "Singing Cow" cameo appearance, and how they were combined to create a magical Yuletide piece. (Click the picture to download the video (7MB)).